Read our interview with Stay Hungry’s founder, Syreeta Gates. Stay Hungry is The Laundromat Project’s featured culinary experience at our Eighth Annual Public Art Potluck (and don’t forget to buy your tickets or support). 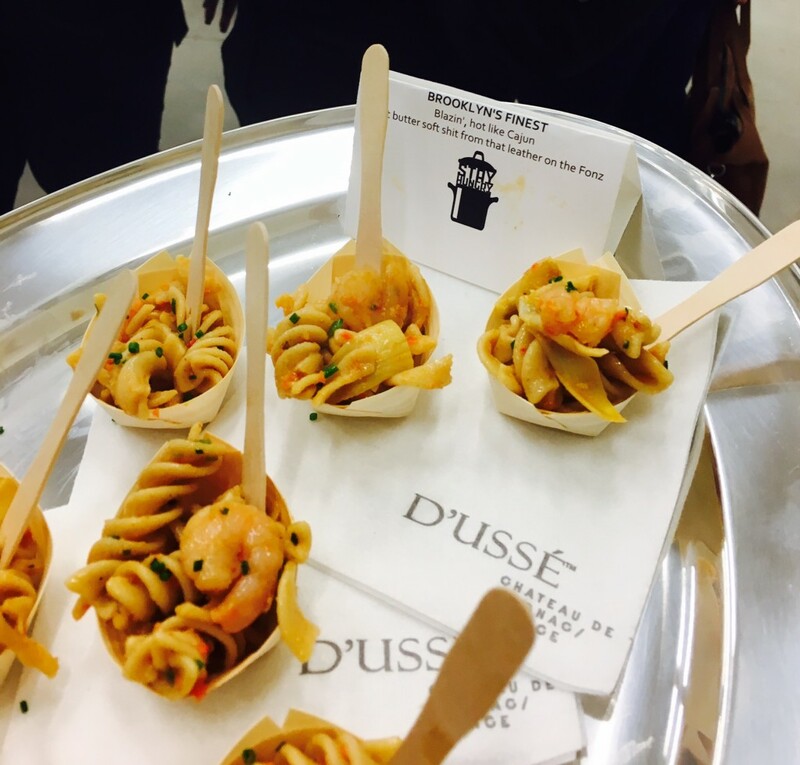 STAY HUNGRY is a culinary experience that bridges Hip-Hop with food and beverage. 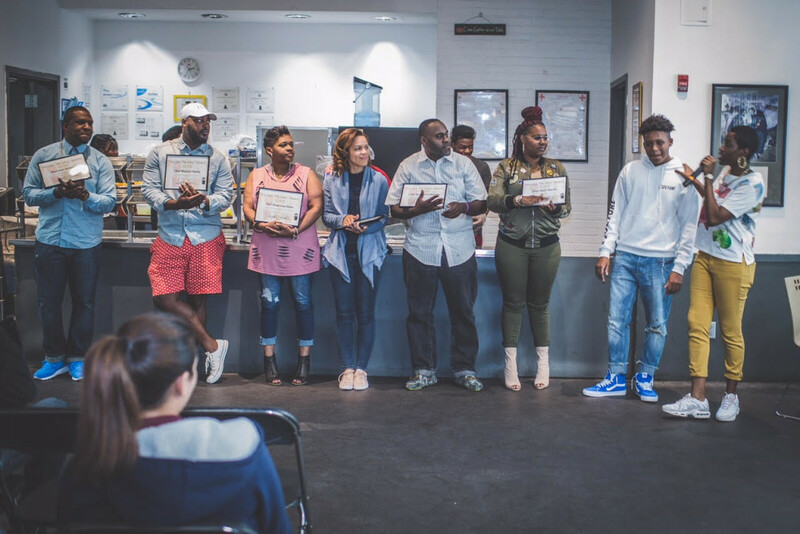 We partner young people, specifically in high school, with chefs, coaches, and they make food inspired by Hip-Hop lyrics for a team of judges. We also do competitions with adults, dinners, catering events, and we have a podcast called #EverybodyEats. Diverse. Fun. Preserving the culture. How has STAY HUNGRY been intentional around some level of social responsibility? We realized that a lot of young people we work with haven’t cooked before…the only thing they might have cooked is cereal. 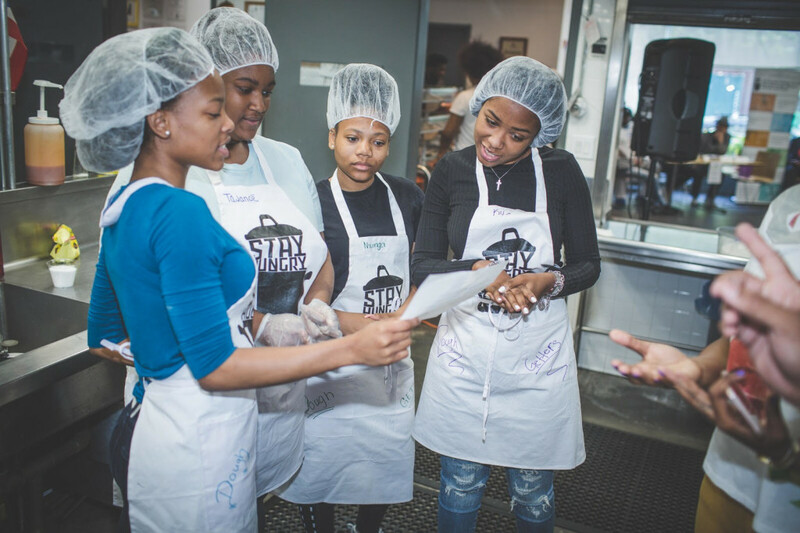 We are intentional with how we use Hip-hop lyrics to promote not only healthy eating but reimagining what young people and adults, specifically people of color are making in the kitchens. Many who we work with come from urban neighborhoods, cities, and/or live in food deserts. I lived in Southside Jamaica Queens and in my 5-block radius, there are 95,000 corner stores, Chinese food restaurants, KFC, McDonalds, Checkers, etc… They’re aren’t healthy options. So at STAY HUNGRY , we think about how we can be intentional about using Hip-hop lyrics to support POC in making healthy food options, while also being intentional about working with people in the culinary industry who are POC. How have you been able to partner with chefs/people in the culinary industry? Our network of chefs has come from word-of-mouth and from sharing the work we’re doing through the culinary competitions. But specifically with partnering with people of color, we want to be intentional not only about how we move in the world, but we know that there is people color in the culinary industry doing amazing things. So partnering with Elle Johnson, Airis Johnson, Nate Wyatte, Ken Williams, other amazing chefs and people in the culinary industry whether they be chefs or food stylists or food or culinary executives of tv shows. We definitely want to spread light and create awareness that YES there are people that look like us in the field of culinary arts, which doesn’t seem like the case very often. What is STAY HUNGRY’s favorite film, book, song, lyric, etc. about NYC? “T bone steak, cheese, eggs, and Welch’s grapes” lyrics from Biggie Smalls. When we tell people what we do, we use these lyric because it is most identifiable with people on the east coast. 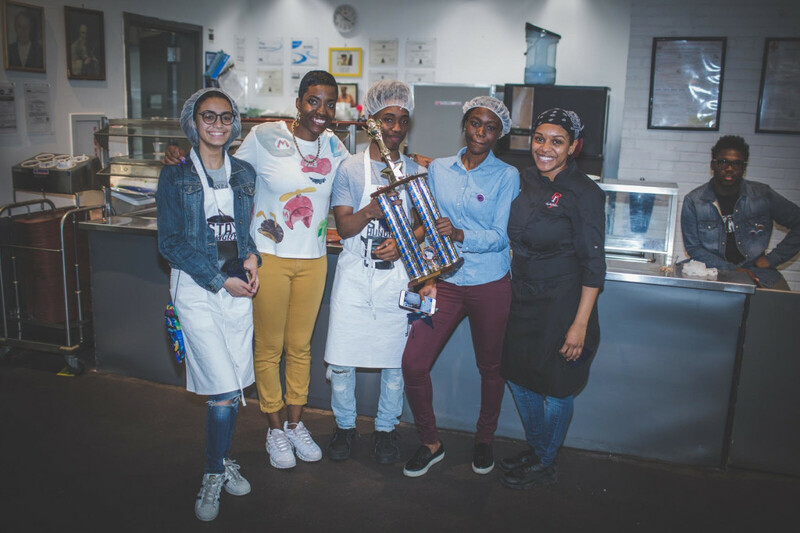 This past year (2017), we did a culinary competition on Biggie Day which is May 21 and we used biggie lyrics as a source of inspiration to cook our food. Can you tell us about STAY HUNGRY’s annual #BiggieDay culinary competition? Our annual culinary competitions are on May 21, which is Biggie Smalls birthday. We chose Biggie because being New Yorkers, we wanted to be intentional about his legacy. Depending on what city we go to, we choose the artist accordingly. Throughout the years of doing this culinary competition and our catering gigs, we have used a variety of lyrics not only from New Yorkers, but DC, Philly, LA… a wide range of food and beverage lyrics. Syreeta, you recently launched the #EverybodyEats Podcast. Can you share more about how this podcast bridges hip-hop with food, beverage, and the hustle and highlights the importance of teamwork? In the movie “Paid in Full,” produced by Dame Dash and Roc-a-fella’ Films, one guy in the film named Ace who is from Harlem (his real name AZ) has a part in the film where he says “everybody eats, B.” So just thinking about what we do at STAY HUNGRY, “everybody eats” is a phrase that many people use, and we have adopted it to have our podcast to talk about Hip-hop, food, beverage, the hustle, and specifically teamwork. Teamwork is very important to the work we do, and far too often, especially in the entertainment industry, we only think of the main person, but we do not think about their team. For example, Jay Z, who is amazing and brilliant, has a whole team and if it wasn’t for them, Jay Z might be moving in the world very differently. The reason we’re stressing teamwork inside of this conversation is that it’s a conversation that is rarely had in hip-hop because we often only look at the main person. How we’re looking at the hustle is whatever a person’s passion is, whatever kind of work their contributions to the world, and for us it’s definitely looking at food and beverage and hip-hop industries in regards to what we do at STAY HUNGRY. The #Everybody Eats podcast is similar to what The Laundromat Project does with working with a variety of artists, in a variety of mediums, and coming together whether it’s putting on particular events, benefit dinners, and raising funds for support. Shrimp scampi dish inspired by Jonathan Mannion and Jay-Z “Reasonable Doubt” album. What’s your neighborhood in NYC, and what do you love most about it? I am from Southside Jamaica Queens, so STAY HUNGRY was born in Southside Jamaica Queens where we had our first competition. One thing I love from being Jamaica is we, outside from a woman named Sylvia Robinson who signed the Sugar Hill Gang and they had their first record. There have been prominent people coming from Jamaica Queens in regards to hip-hop who has changed the game. So Russell Simmons, RUN DMC, Ja Rule, 50 Cent, Nas. It’s amazing to be able to create content for why Queens is important and relevant doing this particular work. And in terms of making an impact of Hip-hop culture, Queens has been on the map. How do you relate food and the culinary arts to the idea of sanctuary? Whether it’s being your family at home or having a brilliant artist like Walter Cruz (2017 Kelly Street Artist-in-Residence and 2016 Create Change Fellow), who is how I found out about the Laundromat Project and is making these phenomenal jackets, that is like a walking sanctuary. He made a jacket for me that said “Create What’s Missing” and I literally feel at home when I am in that jacket. Yes utilizing food but utilizing space as a way to create sanctuary. What excites you the most about working with The LP for our annual Public Art Potluck? And how are you connected to The LP? On October 18th I am looking to EVERYTHING! Literally, all of the things. Buy your tickets to our 2017 Public Art Potluck! STAY HUNGRY is a culinary experience, that fuses a connection between food, beverage, and hip-hop. The guiding values of STAY HUNGRY are #TEAMUS, Everybody Eats, Gratitude, Innovation, Putting on #FortheCulture, and FUN.